With the aim to allow Blackberry customers to control and watch TiVo content anywhere, Tivo and Research In Motion (RIM) have announced a partnership to bring TiVo services to the BlackBerry. 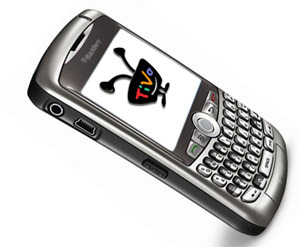 The first step in giving users the ability to watch TiVo on their Blackberry will be that smartphone users will gain the convenience of being able to see what shows are on and schedule television recordings while away. Ultimately, however, TiVo hopes to bring the entire experience to the BlackBerry platform including viewing TiVo content wirelessly from home and perhaps even using future, more advanced BlackBerry models as mobile DVRs. Wow. Can one imagine being able to watch what you miss on your BlackBerry while you’re out on the road taking care of business? That would be a killer app. And imagine if Apple made similar capability with the AppleTV? What a wonderful world that would be.